Foodies and oenophiles, take note! World-famous wines and culinary delicacies are at the heart of this exceptionally scenic journey through northern Italy. Ancient castles, sleepy villages and the region’s unique cascina farmhouses dot your path as you roll through breathtaking landscapes famous for their wines, cheeses and truffles. You’ll savor lunch in a vaulted wine cellar, bake pizza in a wood-fired oven, sample grappa and more. Like the Slow Food Movement that took root in this region, you’ll experience it all at a pace that lets you appreciate it fully. This tour offers a combination of easy terrain mixed with moderate and challenging hills and is ideal for experienced cyclists. Our VBT van support shuttle is always available. However, if you opt to ride with a VBT e-bike (free of charge), the tour is ideal for beginners, as well. Hunt for precious truffles on the grounds of your agriturismo—and enjoy a taste. Savor a tasting of Arneis and Favorita wines, accompanied by local cheese. Bite into a selection of homemade cookies prepared by your agriturismo's pastry chef. Stroll the amphitheater and terraced houses of Pollenzo's ancient Roman settlement. Visit the birthplace of the Slow Food Organization at the internationally renowned University of Gastronomic Sciences. Explore the library and scenic trails of Fontanafredda, a historic Italian winery. Stop in at Grinzane Cavour, a historic castle that is home to the World Auctions of Alba white truffles. Enjoy views of manicured vineyards, castles and Piedmont's unique cascine farmhouses on exhilarating rides. Discover the villages of Barolo and Barbaresco, famous for their eponymous wines. Indulge in a very special lunch in an ancient vaulted cellars in Canelli, birthplace of Asti Spumante wines. Learn to make pizza in a wood-fired stove—and delight in the results. Upon arrival at the Turin airport, claim your luggage and exit through the customs area. A VBT representative meets you outside and helps you transfer to your hotel. The representative will be holding a VBT sign. If you are going to be delayed meeting our transfer representative for more than 15 minutes due to delayed or lost luggage, please let your hotel staff know by calling +39 011 5170171. Ask to pass your message to the driver. Our drivers are generally able to wait for up to 45 minutes from the time your flight lands, after which you will be responsible for your own transfer. However, they might be able to reschedule your transfer quickly if they are aware of the delay. You may also contact our One Call travel assistance to advise of your delay, and they will contact our transfer service. Please note: Check-in time is 2:00 p.m., but hotel staff will do their best to get you to your room as soon as possible. You have the rest of the day free to relax or to explore, using VBT’s City Information as your guide. The morning is yours to explore Turin at your leisure. The hotel is very central and next to the most famous piazzas and cafés. At 12:30 p.m., meet your VBT Trip Leaders in the hotel lobby. They will be easy to recognize in their VBT staff garments. Please have lunch before meeting the rest of the group. All guests will transfer to Canale (approximately 1 hour southeast of Turin), in Piedmont’s Roero/Langhe region. Arrive at your beautiful agriturismo, a country resort and working farm set on an estate of 86 acres (34.8 hectares), where you’ll attend a safety and bike-fitting session. After you settle in and don your bike gear, follow your Trip Leaders on a short warm-up ride through the hotel’s surroundings. Witness the art of truffle hunting as you join an expert farmer, or trifolao, and his dog Willy on the property grounds, to set out in search of the precious underground fungus. During this invigorating outing, you will learn how to choose truffles and how to preserve them. Your hunt will be rewarded with a tasting. This evening, gather for a welcome cocktail back at the hotel, where you will sample local Arneis and Favorita wines and local cheese. Your welcome dinner is at the estate’s restaurant, complemented with wines from their farm. This delicious array of products, fresh from their gardens are a wonderful introduction to Piedmont’s locally sourced cuisine. This morning’s hearty breakfast features jams prepared onsite and a selection of homemade cookies prepared by the pastry chef with nocciola gentile del Piemonte, a locally grown hazelnut. Try a Brut e Bon (“ugly and good”), a Langa kiss or Meliga and Code di Gatto cookie—or one of each! Your route today leads you through some of Piedmont’s stunning farmlands and natural beauty to the ancient Roman city of Pollenzo, today a timeless village whose architecture spans the ages. Though most of the remains of ancient Rome have been destroyed, the shape of the ancient amphitheater is still visible, as you’ll see by walking among the terraced houses built upon the site. In the town piazza, admire the neo-gothic monuments built by the Royal Savoy family, whose King Charles Albert made Pollenzo his favorite holiday resort. Today Pollenzo is home to the internationally known University of Gastronomic Sciences, established in Corte Albertina in 2004 by the Slow Food Organization. The university embraces the latest models of agriculture and the preservation of biodiversity. At the adjacent Wine Bank, more than 300 winemakers regularly select, store and preserve their best vintages, making the history of Italian wines available for future generations. Discover Pollenzo and its treasures on your own during a short stop. Afterward, shuttle across the River Tanaro, the natural northern border of the Langhe, into the heart of the region. The breathtaking hilly landscapes you’ll traverse, or langa, are famous for wines, cheeses and truffles. The winemaking culture, traditions and terrains established are among Europe’s finest examples of man’s harmonious relationship with nature and are considered an aesthetic archetype of European vineyards, earning this entire area a place as a UNESCO World Heritage site. Arrive in La Morra and enjoy lunch on your own. Continue cycling landscaped routes and later settle in and relax at your hotel, perhaps by the panoramic pool, before walking with your Trip Leaders to a local restaurant for a great Piemontese dinner. Today, more of rural Piedmont unfolds. After breakfast, ride through beautiful, hilltop Serralunga d’Alba. Overseen by a majestic castle, this tidy village seems frozen in time. Later, cycle past the headquarters of Fontanafredda, a historic Italian winery. Its cellars are among the 100 finest in the world. Browse its unique library or stroll the trails of its vast park, the Wood of Thoughts, past centuries-old trees, a lake and meditation zones. Continue to Grinzane Cavour, an ideal stop for lunch. Take the time to visit its historic castle, a UNESCO World Heritage site and host to the World Auctions of Alba white truffles. This afternoon, you will loop back to our hotel through Castiglione Falletto, past more stunning vineyards and gently sloping hills. Back at the hotel, enjoy time to relax. Tonight you will shuttle to Alba, the capital of white truffles, for a stroll, some shopping and dinner on your own. You must try the delicious ravioli del plin or tajarin pasta! Today’s route passes through beautiful hamlets. During an inspiring reel, marvel at incredible views of manicured vineyards and castles. You will also cycle by the region’s rectangular cascine farmhouses, unique to Piedmont. The longer sides of these buildings face the sun for warmth in winter and are embellished with an arcaded terrace, stone floors, and iron railings overflowing with colorful flowers. Take in spectacular views of Verduno, Roddi, and other hilltop villages crowned by castles. Later, pedal into Barolo and admire its impressive castle. This quaint medieval village gave the world-famous, light-colored red wine its name. You will have time to explore and enjoy lunch on your own at a local café. Perhaps you’ll sample wine at one of the many cantinas or stroll to the WIMU, the wine museum located in the castle where Barolo wine was born. Here, you can learn the history of the Marquis Giulia Colbert and Carlo Tancredi, both beatified. Relax at your hotel’s swimming pool, and discover this beautiful village on your own. Dinner is on your own tonight with either La Morra or Monforte offering many options. After breakfast, take a 30-minute shuttle to the start of your route: the charming hilltop village of Barbaresco. Famous for its eponymous wine made from Nebbiolo grapes, the town’s small former church hosts the Enoteca Regionale. Your route unfolds among the hills overlooking the dreamy valley of the Belbo River. You’ll enjoy magnificent vistas with little evidence of the wartime scars it bore when many of its villagers fell during WWII. Your destination is Canelli, famous as the home of the largest producers of Spumante d’Asti, the Italian sparkling wine created in this small city 150 years ago. Enjoy lunch in one of its most ancient vaulted cellars, a UNESCO World Heritage Site so vast, it’s known as an “underground cathedral.” While here, you can raise a glass to its 150th anniversary, celebrated in 2017. One of the proud owners, Giovanna Rivetti may join you for lunch and prepare local specialties like friciule bread and vegetable pies. Savor them with cooked salami, handmade grissini, salted hazelnuts from Cortemilia, and, of course, a tasting of selected spumanti della casa. After, continue riding through the breathtaking countryside to Mombaruzzo and our next accommodation, a chic country retreat revived from the ruins of a 1600 villa. Your welcoming British host, Nicola, relocated here after falling in love with the region. At sunset, after you have time to relax and settle in, she invites you to join her in the manicured garden and barbecue area, where you’ll learn to prepare pizza the traditional way, around the wood-fired oven. Customize your own pizza during this fun and relaxed class, and enjoy the results with a glass of wine and spectacular views from the terrace. Today, your choice of routes includes a more relaxed and easy loop, a spectacular hilly ride with sweeping vistas, or both. The countryside south of Asti, in the Monferrato region, is dotted with sleepy hilltop villages. Explore it your own way, and you’ll rejoin the group in Mombaruzzo at a local farm where the hosts prepare your lunch. Return to your hotel during the afternoon taking the short route or the long and hillier panoramic option, then relax at the hotel pool and in the aromatic garden. This evening, gather for a wine Barolo tasting, followed by a special farewell dinner under the stars. VBT Air Package and Post-Trip Extension guests: After breakfast, transfer to Rapallo in Liguria, gateway to Cinque Terre and Portofino. At about 11:00 a.m., you will arrive at your luxurious, bayfront hotel, the only 5-star hotel on the entire Riviera di Levante. Your room may not be available until 3:00 p.m., so you can store your luggage with the reception desk. Join our local expert for an included orientation tour of Rapallo. You will quickly find that walking is the best way to discover Rapallo. Enjoy leisurely strolls amid its Old Town, bask in its seaside ambiance, or follow footpaths into the hills for spectacular views. You might walk the trail up to Sanctuary of Montallegro, the most important religious center in the Tigullio area, stopping at the lovely San Fruttuoso Abbey on the way. The sanctuary is also accessible by cable car, but you’ll miss seeing the abbey. You can also unravel Rapallo’s lace-making tradition at the Lace Museum, housed in the 17th-century Villa Tigullio. Alternately, you can opt to venture to Cinque Terre, five stunningly beautiful and colorful villages linked by tranquil walking trails. If you have chosen the independent Post-trip Extension to Rapallo, you will remain at this hotel for three nights. Our local representative can answer your questions and help you discover Cinque Terre and Portofino during your stay. VBT’s City Information includes recommendations for restaurants, museums and transportation in the area, and will help you explore on your own. After breakfast*, transfer to Genoa airport (40 minutes, depending on traffic) for your departing flight. Please ensure you are ready in the hotel reception area at the designated transfer time**. **Please note: VBT recommends checking your transfer time in your “Transfer Reminder.” VBT transfer times and departure points are finalized in advance and cannot be modified for individual guests. If you extend your stay beyond the scheduled program dates, return transportation to the airport is at your own expense. 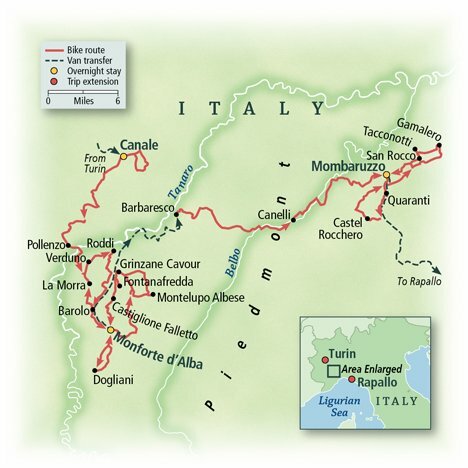 VBT-Bicycle-Vacation-only guests: Your tour starts at 12:30 p.m. at our Turin hotel. Your Trip Leaders will be in the lobby wearing VBT staff garments. Please have lunch before meeting them. If your arrival at our Turin hotel is later than 12:30 p.m. or if you are delayed, please call the hotel and ask the front desk to pass the message on to your VBT Trip Leaders. After breakfast you will be transferred by private motorcoach to the railway station of Alessandria, arriving around 9:30 a.m. Your tour ends here, and frequent train connections can take you back to Turin’s Porta Nuova station in about an hour. You are responsible for your own train travel and transfer to the airport for your flight home. The refined and elegant Hotel Villa Beccaris, named for a 19th-century general in Italys Wars of Italian Independence, boasts a stunning hilltop location with magnificent views of Monforte dAlba and the vineyards of Langhe. Strolls along cobbled streets to the citys castle are right outside your door. Designed to evoke classical Italy, the 18th-century villa is surrounded by parkland with a swimming pool and sun deck for lounging. Start each day over a fresh breakfast in the sunny and charming orangerie, a garden oasis awash in light and surrounded by carefully sculpted iron and wood detail. Each guest room is elegantly adorned with period furnishings, beautiful frescoed ceilings and modern bathrooms. Free Wi-Fi is available throughout the property. Inspired by the Belle Epoque elegance of the early 1900s, Rapallos Excelsior Palace delivers 5-star luxury and service. Far from city traffic, its dramatic coastal setting provides stunning views of the bay to the east and the headlands of Portofino to the west. Take in these spectacular vistas from one of the many terraces or from the infinity pool. 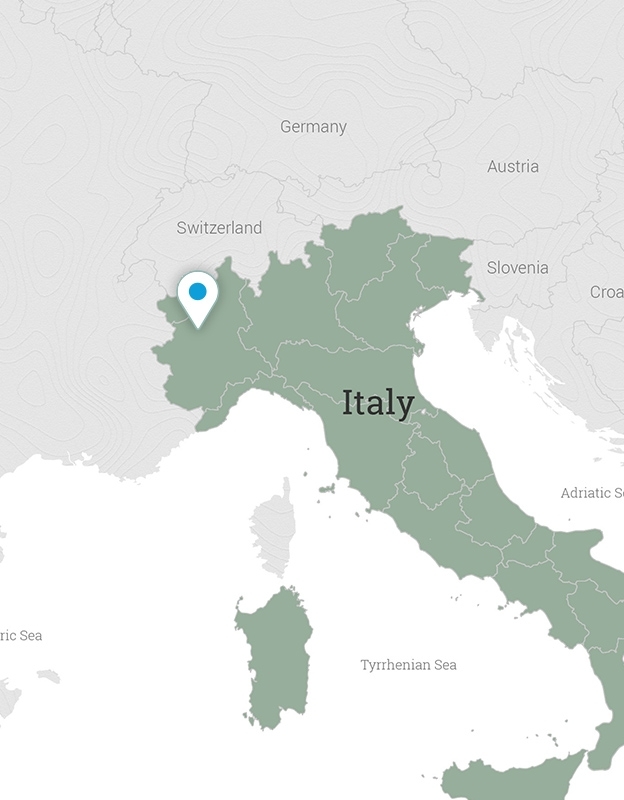 Ferries to Cinque Terre are just a 10-minute walk away. Throughout your stay, you will enjoy the refined ambiance, panoramic restaurants, scenic swimming pool and poolside bar, private pier, and access to the sea for swimming. Make the most of your stay with a massage or spa treatment at the hotels Wellness and Beauty Spa. Free Wi-Fi is available in the lobby. Nestled on 86 acres of farmland, Le Querce del Vareglio was lovingly restored in 2004 from the ruins of a typical 17th-century cascina. Beautiful frescoed ceilings and beams preserve the old-world charm. You’re sure to find your hosts’ passion about the country and farming life contagious as you stroll the property’s trails, visit the horse stables and even pause to visit the onsite wine cantina. Excellent wines are produced from the well-manicured vineyards of Barbera, Nebbiolo and other grapes, and lush peaches grow in the orchard. You’ll savor the harvest of Le Querce del Vareglio throughout your stay as ingredients for your meals are plucked fresh from the soil, including the truffles dug up from under the oak and willow trees. At the end of a day of cycling, you can cool off in the swimming pool, and free Wi-Fi is available throughout the property. A landmark four-star hotel located in the heart of the city and ideally positioned for exploring Turin on foot, this property is renowned for its history, elegance, and hospitality. With its regal Empire styling, gracious courtyard terrace, and Michelin-starred restaurant specializing in local fare, its the ideal retreat for travelers hoping to enjoy Turins Old Town and Quadrilatero Romano. The highly awarded Hotel La Villa was built in 1600 and has been painstakingly restored by British expats and owners Nicola and Chris. Today it is a stylish and chic retreat graced with simple luxuries. Its light, airy rooms are adorned in soothing colors, sensuous fabrics and the finest linens. Local antiques and hand-crafted accents add a personal touch. The garden was designed by Nicola and thrives under her skilled hand. Enjoy breakfast each morning among the blooms and in the adjacent courtyard, relax poolside and linger on the terrace as the sun slips behind the hills before dining under the stars. This spectacular property has received numerous accolades for its refined and casual atmosphere, supreme location and exemplary service. Free Wi-Fi is available throughout the property. Please note: Check-in time is 2:00 p.m., but hotel staff will do their best to get you to your room as soon as possible. A local VBT representative is available at 4:00 p.m. at the hotel to answer your questions and offer a walking orientation tour near your hotel to get you familiar with public transportation and orient you in Turin. She will also propose optional tours to discover the city over the next few days. You have the rest of the day free to relax or to explore, using VBT’s City Information as your guide. The day is yours to explore the historic treasures of Turin as you wish. You might head to the Cathedral of St. John the Baptist, where the mysterious Shroud of Turin, said to have once covered the head of Jesus, is kept. Visit the very interesting National Museum of Cinema in the towering Mole Antonelliana, symbol of the city and tallest museum in the world. Or the Egyptian Museum, second only to Cairo’s. Board a mountain gondola just outside the city for magnificent views. Or explore one of the Residences of the Royal House of Savoy, a UNESCO World Heritage site consisting of the splendid Castello del Valentino, the sprawling Reggia di Venaria Reale, and the regal Palazzina di Caccia di Stupinigi. You have another day free to explore Turin. It’s a perfect opportunity to linger in some of its many historic cafés and chocolate shops, and watch local Italian life unfold around you. Or maybe browse Eataly at Lingotto. VBT’s City Information has ideas and tips to use as your guide. The day is yours to explore this breathtaking little corner of Italy, dotted with intimate and colorful seaside villages. You might choose to explore Cinque Terre by ferry or train. This UNESCO World Heritage site and treasured national park comprises five charming villages clinging to rocky hills kissed by gentle surf. Roadways are few to the villages, so it’s best to make the short journey by boat or train and explore by foot, tracing the scenic foot trails that link them together. From the sea, you’ll enjoy stunning views of the rugged coastline, pastel-hued houses, stone stairs, Romanesque churches and tiny harbors. The ferry landing is only 8 to 10 minutes on foot from your hotel. Today’s opportunities are many. You can walk along the sea, into the hills to nearby Santa Margherita Ligure, and to Portofino, nestled quietly on its namesake turquoise bay. The marked paths are part of the Monte di Portofino Nature Park and offer fine views of Mediterranean flora, from olives trees and holm oaks to gorse and chestnut trees. If you prefer, spend the day in Genoa exploring the Old Town. This city on the sea is home to one of the largest sea-life aquariums in Europe. Its Galata Museo del Mare is the first Mediterranean maritime museum. Upon returning to your hotel, relax at the luxurious fitness and wellness center overlooking the sea and enjoy the swimming pools and private beach. In spring and summer, you may dine on the cliff-top terrace. After breakfast*, transfer to Genoa airport (40 minutes, depending on traffic) for your departing flight. Please ensure you are waiting in the hotel reception area at the designated time**. **Please note: VBT recommends checking your transfer time in your “Transfer Reminder.” VBT transfer times and departure points are finalized in advance and cannot be modified for individual guests. If you extend your stay beyond the scheduled program dates, return transportation to the airport will be at your own expense.